When was the last time you danced with a sea lion, got caught up in a giant squid battle, or navigated a submarine labyrinth of kelp? At the National Geographic Encounter in New York City, entertainment developer SPE Partners has employed cutting-edge audiovisual technology to take visitors on a stirring voyage through the depths of the Pacific Ocean so visceral it almost makes you hold your breath. According to Svezia, it took three years from initial concept until the Encounter’s opening in October 2017. After setting things in motion with National Geographic, SPE reached out to Falcon’s Treehouse, the attraction design division of Orlando, FL-based firm Falcon’s Creative Group, to formulate the technological approach. “It all starts with storytelling,” Svezia said. “We wanted to tell a specific story about traveling through the Pacific Ocean. We gave Falcon’s Treehouse the story and a wish list of what we wanted, and they came back with solutions.” Falcon’s then coordinated their design with Austrian integration firm Kraftwerk Living Technologies, which carried out the installation. Captained onward by a jaunty tour guide who enjoins visitors to “swim along” from room to room, the Encounter begins with a grand precedent of what’s to come: a 30-foot-wide screen that melds seamlessly with the floor, illuminated with edge-blended projection. Two large Panasonic projectors display a 4K underwater scene on the main screen, while an array of downward-shooting Epson projectors extends the spectacle, allowing visitors to walk about the sea floor. 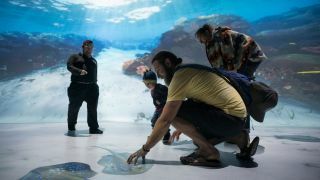 Implementing interactivity through motion-capture cameras, creatures like stingrays react to guests’ footsteps, swimming to and fro to avoid danger. QSC speakers—which are used throughout the Encounter—envelop the explorers in the ambiance of the deep, further enhancing the experience. From there, the tour heads into a space simulating a coral reef where large, glossy rear-projection screens linked with Microsoft Kinect sensors allow visitors to stir up bioluminescent organisms with hand gestures, while more motion-activated, ceiling-mounted projectors cover the floor with interactive phosphorescence. Next, the transpacific voyage enters its overnight phase, and visitors are ushered into a room that is darkened to near pitch blackness, where they are submerged in the songs and cries of whales all around them, courtesy of an IOSONO three-dimensional sound system and a score featuring actual audio from the oceans depths. The passengers then emerge into a dimly lit passageway flanked by projection screens, where Panasonic large-venue projectors present a territorial battle of two Humboldt squids, whose duel ping-pongs about the space, from one screen to the other. Visuals for this are CGI, created by Oscar-and Emmy-winning visual effects company Pixomondo—the firm responsible for the dragons in HBO’s Game of Thrones. Upon successfully navigating a supremely disorienting, mirror-walled maze of giant kelp—made even more flummoxing through the use of Samsung mirror displays at the dead ends—visitors enter a more lighthearted exhibit: a hall featuring a series of large, portrait-oriented Samsung flat panel displays, each featuring a unique CGI sea lion with a distinctive personality. Using Kinect sensors mounted above the screens, the mammals respond to guests’ gestures and body movements with jocular acrobatics. The Encounter concludes with a spectacular finale—a roughly 4-minute-long CGI video created in 8K resolution at 60 frames per second, in 3D, and mapped onto a 40-foot-tall curved dome by 24 projectors. Intended to simulate being trapped in a bait ball, visitors stand on a raised platform and are engulfed in a parade of marine activity—including tornadic schools of fish and menacing sharks—fluttering above, below, and around them. After the Encounter’s voyagers’ journey is complete, participants resurface into the educational portion of the tour, featuring areas replete with hands-on touchscreens, games, and social media-linked kiosks where they can learn more about the animals and habitats they’ve just experienced, and share their pledges to help keep the oceans clean. In addition to the public-facing areas of the facility, there’s also a 5,000-square-foot event space that can accommodate up to 600 guests, featuring a Bose Pro Audio system and a 40-foot-wide Samsung Prismview 2.5mm pixel-pitch direct-view LED wall; according to Svezia, this is the first facility to receive this brand-new display line from the manufacturer. But Svezia said that choices in equipment limit the amount of maintenance that’s needed: all the projectors are laser-based, so they don’t require lamp replacements, and the alignment of projectors involved in mapping exhibitions is done automatically via camera calibration at the start of each day. In terms of a refresh schedule, all of the technology in operation is meant to last at least three years—when the Encounter’s scenery will be swapped out for a different theme, such as outer space, and the production teams will formulate a new way of immersing visitors in an experience they couldn’t get anywhere else. “That’s the whole meaning behind the National Geographic Encounter brand: to take people to places they may not get a chance to go,” Svezia said.